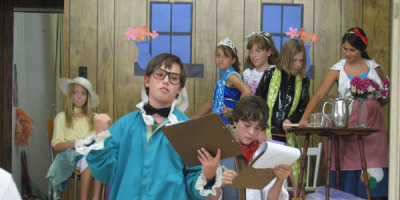 We have been offering our theatre camp programs since 1994; thousands of kids and families from across the GTA and southwest Ontario have participated, and many kids have gone on to shine, some of them on stages, on TV and in films, and many more in their schoolwork and in local community groups and activities, through the skills and confidence our programs have helped them to develop. 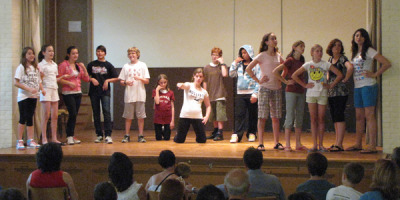 GBTC emphasizes basic skills, appropriate to each individual age level, in areas such as voice, movement, working with scripts, clear speech, expressing emotions, and developing character; we also work to encourage participation and develop confidence. We offer a low ratio (between 7:1 and 8:1) of campers to staff, so that each camper gets sufficient individualized attention. 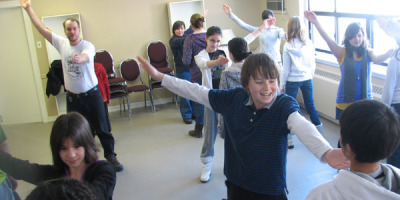 In addition, each age group prepares its own segment of the end-of-week performance, so that everyone participates equally, as much as possible.